Summer officially starts later this month, but we're already thinking ahead to wine grape harvest season. We have a great selection of equipment available for rent during harvest season at Curds and Wine. If you are looking for large equipment to purchase for your home winery, such as stainless steel tanks, presses, crushers, et cetera, please contact us for pricing. These items need to be preordered the next few months and will not be available later in the year. We are also taking preorders for barrels, see more details below. We are just starting up our Winemaking from Fresh Grapes classes, you can still sign up online here. Our first Hands-on Harvest class 2011 syrah just won a silver medal at the Winemaker Magazine homemade wine competition! We might still have some openings in our Hands-on Harvest course or Grapes to Glass course for 2013, contact us for details and to check for availability - and make your OWN award-winning wines with us this year! The Basic Winemaking Seminars do not include making wine; we do offer two additional courses where you can make your own award-winning wines from fresh grapes on site. 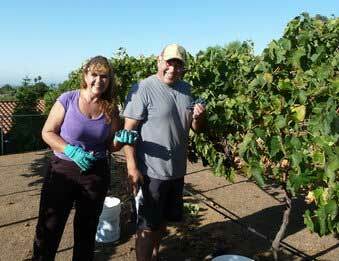 Our Hands-on Harvest course gives you the opportunity to hand-harvest syrah from a Fallbrook vineyard - our first class of 2011 just won a silver medal for their syrah! 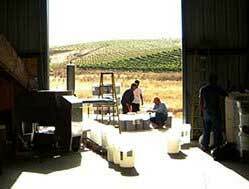 We also offer a Grapes to Glass course where you make wine from grapes delivered from West Coast Grapes. There are only 1 or 2 spots left in each of these courses for 2013, contact us to sign up! In association with San Diego Amateur Winemakers' Society, Curds and Wine will be hosting bi-monthly home winemakers' seminars. These seminars are held every even numbered month on the third weekend (Sunday this time!) at 1 pm. Seminars are given by Lum Eisenman, a winemaking guru that we are lucky to have in the San Diego area. Lum will share his expertise on various winemaking techniques and issues. This month Lum will help us "Getting ready for Crush". These seminars are free, but limited to 20 people. If you are interested in participating, please RSVP online here. 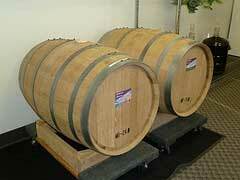 Preorders must be placed by Sunday, August 18th so that we can get the barrels in stock for harvest season. Queso Diegan Virginia Masters will be hosting the Cheese for Chiapas Gala on Saturday, July 13, 2013 from 6-9 PM. This Cheese for Chiapas Gala evening will provide seed funds to establish a self-sufficient, cheese making community enterprise in the poverty stricken highlands of Chiapas, Mexico. All proceeds from the Cheese for Chiapas Gala will go directly to purchasing cheese making supplies and setting up a cheese making workplace within an autonomous, Mayan community. This pilot cheese making project, which will be mostly be carried out by Tzotzil women and children, is designed to provide an improved diet as well as financial security for several Mayan farming families. 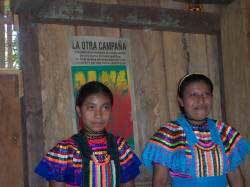 If successful the cheese project will be reproduced in a variety of Mayan communities. The event includes cheese-based appetizers, entries, and deserts; wine, beer, and non-alcoholic drinks; local and international honeys; plus traditional Mayan foods. Finally there will be information about, and artwork from, the autonomous, Zapatista communities of Chiapas, Mexico. Cost: $25 to $50 sliding scale donation; all donations above $25 are tax deductible. Seats and tickets are limited to the first 50 people who purchase - Buy your tickets online today! We are happy to announce that we will soon stock RJ Spagnols wine kits in addition to Winexpert and Cellar Craft Wine kits. Contact us to let us know your favorite RJ Spagnols kits you would like to see in stock! Curds and Wine will soon be a retailer for Brehm frozen musts. Orders will be prepaid and customers must pick up their pails within 3 days of receipt at Curds and Wine. We will not be making wine on site from frozen pails at Curds and Wine in the immediate future, you must make your wine from frozen musts at home. 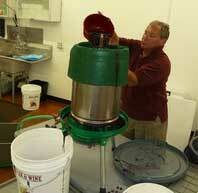 We do have all of the supplies and equipment you need to turn your frozen must or juice into award-winning wines! Watch our Facebook page and our next newsletter for more details. Contact us for more information or to place a preorder today! A record number of wines were submitted to the 2013 Winemaker Magazine Amateur Wine Competition -- 4,564 total! We brought home 2 medals this year, a silver medal for the 2011 Hands-on Harvest Fallbrook Syrah, and a gold medal for our Cellar Craft Showcase Pinot Gris. Our customer Susanne Hunter also won a silver medal for her Cellar Craft Showcase Gruner Veltliner. Congratulations! Come in to Curds and Wine today to make your OWN award-winning wines!